Born Eau Claire, Wisconsin, May 21, 1952; married. Graduate Altoona Public High School, 1970; attended University of Wisconsin–Parkside. Former member: UAW Local 72 (chair of trustees, shop committeeman, bargaining committee, executive board). 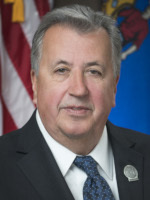 City of Kenosha alderman, 2008–14. Relating to: wetland mitigation banks, providing an exemption from emergency rule procedures, providing an exemption from rule-making procedures, and requiring the exercise of rule-making authority. Relating to: establishing campaign contribution limits for contributions to certain persons. Relating to: decreasing individual and candidate committee contributions for statewide officeholders.